2010 was a big year for the Flash. After five years of meandering (since DC decided to cancel Wally West’s series during Infinite Crisis because, hey, you can’t have a Crisis without a dead Flash, but couldn’t figure out what to do with the relaunch), it’s beginning to look like DC has finally gotten the character back on track. 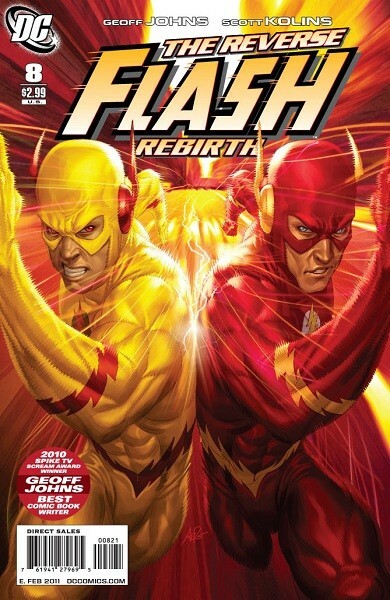 The year opened with the wrap-ups of the Flash: Rebirth and Blackest Night: The Flash miniseries, then ran headlong into the Flash vol.3 relaunch in April by Geoff Johns and Francis Manapul. The new series starring Barry Allen has completed its first story arc, introduced new characters in the form of reverse-Rogues, and presented two Rogue Profile spotlight issues. On the downside, the series has been plagued by delays since summer, and those two Rogue spotlights were added to help get the book back on schedule. Barry Allen has been all over the place: The Flash, Blackest Night, Brightest Day, Green Lantern… A number of Barry Allen/Flash action figures have also been released or announced this year. 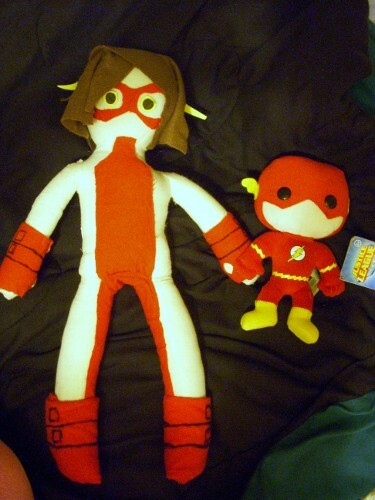 Bart Allen, as Kid Flash, has rejoined the Teen Titans. Jay Garrick continues to be a mainstay of the Justice Society of America. On TV, Batman: The Brave and the Bold featured a Flash-focused episode starring Jay Garrick, Barry Allen and Wally West (as Kid Flash)…with John Wesley Shipp voicing Professor Zoom. Cartoon Network’s Young Justice launched with Kid Flash as a main character. And of course there’s the continuing presence of Flash fandom on The Big Bang Theory. This entry was posted in General and tagged 2010, New Year on December 31, 2010 by Kelson. The Professor Zoom spotlight in The Flash #8 (review coming soon) reminded me of something that’s been bugging me about the current version of the character. 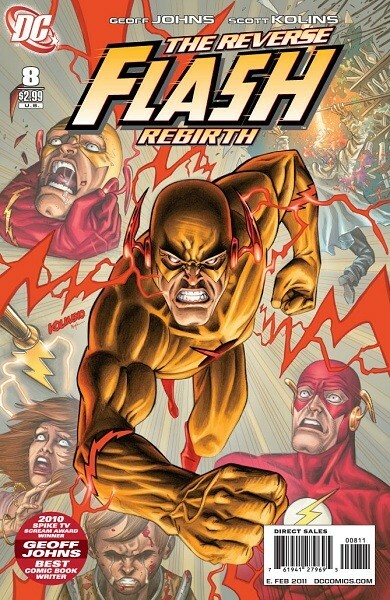 In Flash: Rebirth, it’s pointed out that while Eobard Thawne can change history to make Barry Allen’s life a living hell, he can’t prevent Barry from becoming the Flash. Without a Flash, there’s no Reverse-Flash, and without the positive speed force that Barry Allen generates, there’s no negative speed force for Thawne. Somewhere along the line, it turned into the idea (stated in The Flash Secret Files 2010) that Thawne can’t kill Barry Allen because he needs Barry’s speed force to power his own. 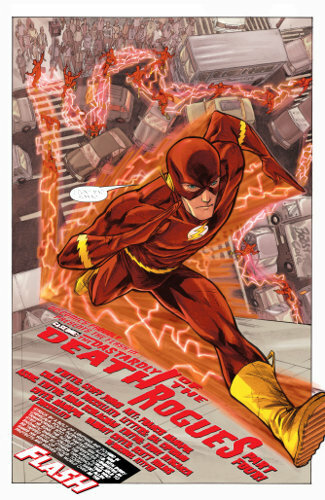 They made a big point that the speed force, once generated, stretches out and touches all times, past and present. That’s why Jay Garrick, Johnny Quick and Max Mercury could have super-speed before Barry was even born. That’s why John Fox and Eobard Thawne could have super-speed centuries after Barry’s death. That’s why Wally West, Bart Allen, Jesse Quick, and the surviving older speedsters could all have super speed while Barry was gone. Thawne can’t erase Barry Allen from history, but he can still kill Barry anytime he wants…after Barry becomes the Flash! This entry was posted in Opinion and tagged Barry Allen, Flash: Rebirth, Professor Zoom, Speed Force, Zoom on December 31, 2010 by Kelson. The webcomic Comic Critics presents its take on Grant Morrison-style minimalist origin retellings of various super-heroes, including the Flash. Head over to Comic Critics to read the conclusion (and the rest of the origins). As for the Flash one: Harsh, but so, so true. 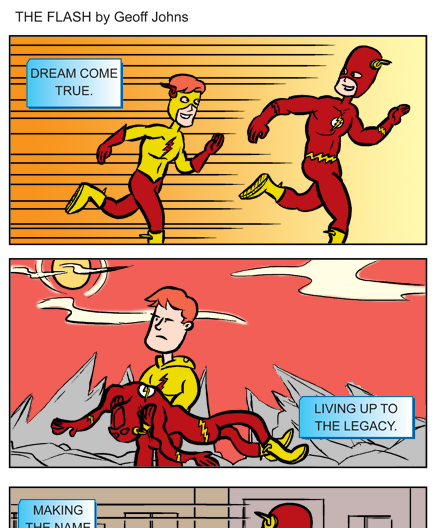 This entry was posted in Flash History and tagged Comic Critics, Humor, Origin, Wally West on December 29, 2010 by Kelson. 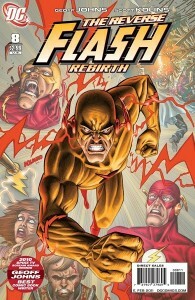 This week sees the release of The Flash #8, a one-shot Rogue Profile story focusing on the Reverse Flash. “Reverse Flash Rebirth!” In this FLASHPOINT prelude, don’t miss the epic telling of the origin of Barry Allen’s greatest foe, Professor Zoom! Eobard Thawne’s story is just beginning — and he intends to finish it with The Flash! If you haven’t seen it, DC released a preview last week at the Source and at CBR. This entry was posted in Out This Week and tagged Zoom on December 28, 2010 by Kelson.